he Graco Reactor 2 E30 with a 10 kw heater is able to improve performance and ease of management as soon as you are up and running. The design itself of this new Reactor 2 is based solely on features that improve performance or that make operation and equipment management smoother. Dive in to the Reactor 2 E30 for spray foam insulation and you will have an investment that pays off for years to come. Available in several package variations, the Graco Reactor 2 e30 can be purchased as a standalone unit, featuring the 10 kw heater. It can also be ordered and accompanied by the Fusions AP package, which provides the spray foam insulation Reactor 2, the Graco Fusion AP Gun, a 10 foot whip, 50 foot heated hose a scuff guard and mixing chamber. Additional packages that are available are the Reactor 2 E30 Fusion CS and the Reactor 2 E30 Probler P2 Packages. 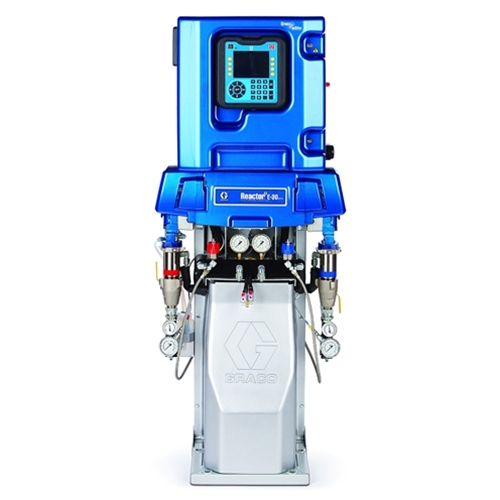 The Graco Reactor 2 E30 is ideal for spray foam insulation applications. As a standard equipment model, the Reactor 2 E30 can be upgraded to include features that are available in the Elite models of Reactor 2 equipment. Upgrade to Graco InSite Technology, a better scuff guard for the hose in packages and even improved monitoring with inlet pressure and temperature sensors. Choose from a range of features across multiple models, and streamline your spray foam insulation jobs now. Choose the Reactor 2 E30 today and enjoy meticulously planned features leading to increased performance and decreased downtime. The Reactor 2 E30 with 10 kw heater can be serviced easily thanks to the new design, it takes up less space in your rig and in storage, and has advanced circuitry that can withstand power surges and general common fluctuations. Upgrade to the Reactor 2 E30 Elite here. Either way, you get consistent spray foam insulation results with Graco product support and service at Intech Equipment and Supply.